What's it take to make an awesome Christmas House? 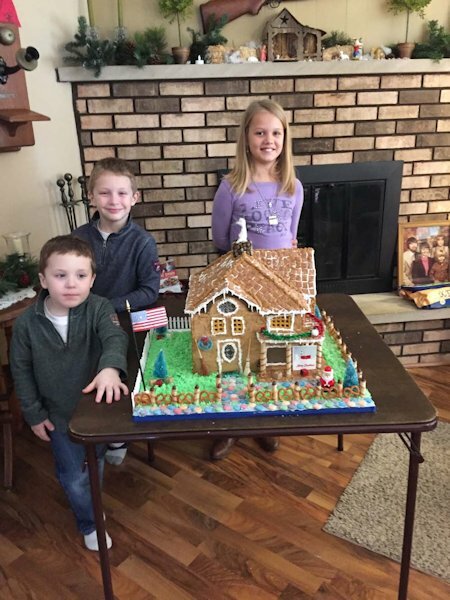 At the Kenny and Anita Brown home in La Harpe, it takes a creative grandfather, three grandchildren, and this year, over 3 pounds of sugar for the frosting to build the annual project! Kenny said the grass is frosting, the fence is mini pretzels, the posts are chocolate Pirovline cookies with chocolate chips on top, the sidewalk is frosting and sweet tarts, the roof is rice chex and wheat chex. "It was a lot of fun!" "Life is good, God is great, Our Grandkids are a blessing!" Pictured is Mason and Matt Whitman, and Laney Brown.